PSA/DNA claims to be the world's leading autograph authentication company, and unfortunately many if not most autograph dealers believe that to be true. In my experience, JSA (James Spence Authentication) is more consistent and reliable, less prone to play favorites with their favored dealers, and less likely to be fooled by autopens and preprints. All of the above is a matter of opinion, of course, but I run across glaring examples of PSA/DNA incompetence all the time. 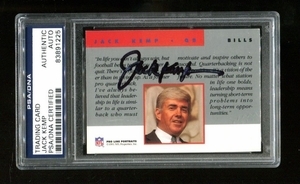 The 1991 Pro Line Jack Kemp "certified" autograph card with the NFL embossed stamping was identified as autopenned -- yes, every last one of them --almost as soon as the first one was pulled from a pack. This fact was widely known for 25+ years. So for PSA/DNA to authenticate even one of these cards is truly embarrassing. But they've authenticated at least two to my knowledge and probably more. I noticed that PSA/DNA also has authenticated other Jack Kemp autographed non-certified vintage cards that appear to me to be likely autopens, so beware. Another extremely common autopenned signature is President Gerald Ford, who used his machine on EVERYTHING including baseballs and golf balls. PSA/DNA was fooled many times, authenticating who knows how many Ford autopens. What's worse than authenticating an autopen? How about a preprinted signature? Yes, PSA/DNA did that too with a vintage Jesse Owens photo card. It fooled me, too, but to their credit, a JSA authenticator caught it immediately. PSA/DNA didn't, they authenticated and slabbed at least one of them. I am sure JSA isn't perfect as like any company that deals with authentication, it's an art more than a science. However, from what I can tell, it's PSA/DNA that has the biggest problem with expertise, particularly with autopens and preprints. And in the autograph authentication business, not authenticating those ought to be job #1.